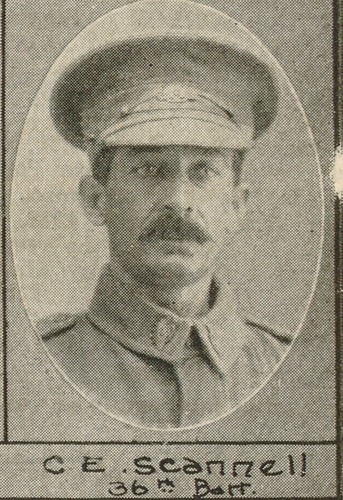 Son of William & Florence Sadleir. Embarked: 29-6-1915, Fremantle, Western Australia per "Ascanius"
Son of William and Eliza Salmon, of Hillside, Beack, Victoria, Australia. Next of Kin: Brother - Thomas Sammon, 79 Standish Ave., Providence, Rhode Island, U.S.A. Embarked: 22-12-1916, Melbourne, Victoria per "Persic"
Son of Richard & Martha Scandrett, of Dunmore, Ballynahinch, Ireland. Son of Denis & Johanna Scannell. Next of Kin: Sister-in-law, Nora Scannell, Holterman St., Crows Nest, N.S.W. Embarked: 30-3-1916, Brisbane, Queensland per "Star of Victoria"
Embarked: 17-11-1916, Brisbane, Queensland per "Kyarra"
Embarked: 20-6-1916, Melbourne, Victoria per "Runic"
Next of Kin: Sister - Margaret Williamson, 48 Eglantine Ave., Belfast. Son of Mr. and Mrs. Searles. 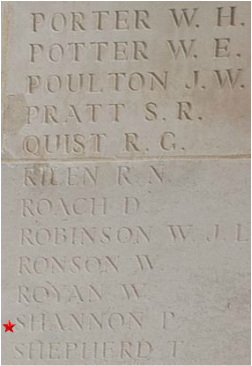 Embarked: 28-3-1916, Queensland, per "Commonwealth"
Son of Henry & Mahala Sergent, Plinburne, Hurworth, New Plymouth, New Zealand. Embarked: 25-9-1914, Brisbane, Queensland per "Rangatira"
Son of Robert John & Margaret Seymour, of Carnagh, Castleblayney, Ireland. 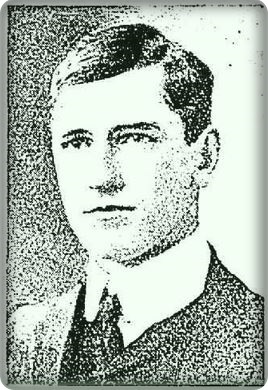 Embarked: 13-4-1915, Sydney, New South Wales, per "Kyarra"
Embarked: 2-2-1915, Melbourne, Victoria per "Clan McGillivray"
Next of Kin: Brother - John Joseph Shannon, Farm No. 732, Leeton, N.S.W. Son of Samuel & Agnes Shannon, of Montalto. Newtown Crommelin, Ireland. Embarked: 2-11-1915, Sydney, New South Wales per "Euripides"
Son of James and Jane Sharkey. Embarked: 14-7-1915, Sydney, N.S.W. per "Orsova"
Re-embarked 16-7-1915, Melbourne, Victoria per "Demosthenes"
Embarked: 20-2-1916, Sydney, N.S.W. 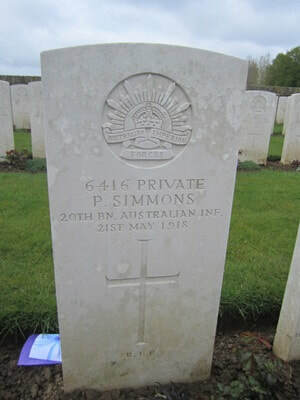 per "Ulysses"
Son of Haliburton & Sara Sheppard, of 331, Collins St., Melbourne, Australia. Embarked: 21-10-1914, Melbourne, Victoria per "Orvito"
Embarked: 9-11-1915, Sydney N.S.W. per "Beltana"
Son of Martin and Mary Simmons 4 Cottenham Street, Glebe, N.S.W. Next of Kin: Sister - Ellen Simmons, 4 Cottenham Street, Glebe, Sydney, N.S.W. 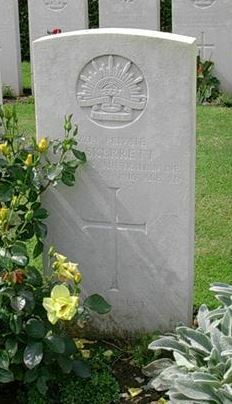 Son of Henry and Jane Skerrett, of 5, Sandford Avenue, Dublin, Ireland. Husband of Mary Jane Slavin, of Victoria St., Albert Park, Cheltenham. South Australia. Embarked: 27-10-1915, Adelaide per "Benalla"
Embarked: 27-11-1915, Sydney, N.S.W. 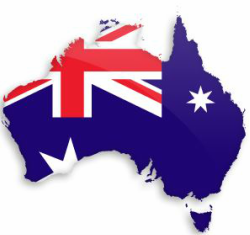 per "Suffolk"
Embarked: 2-9-1915, Fremantle, western Australia per "Anchises"
Son of Michael and Johanna Smith, of Maudlintown, Wexford, Ireland. Embarked: 20-8-1915, Sydney, N.S.W. 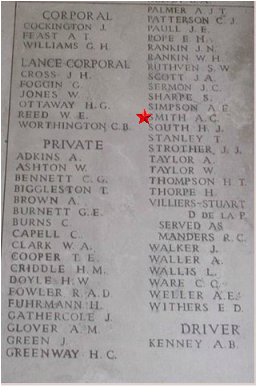 per "Shropshire"
Son of Richard & Jane Smith, of Suite 9, Broughton Apartments, Vancouver, British Columbia, Canada. Embarked: 20-10-1914, Sydney, New South Wales per "Euripides"
Embarked: 16-4-1915, Brisbane, Queensland per "Kyarra"
Next of Kin: Friend - Lena Hanlon, 65 Cambridge St., Paddington, N.S.W. Embarked: 16-6-1915, Sydney, N.S.W. per "Karoola"
Embarked: 11-4-1916, Adelaide, Sth. Aust. 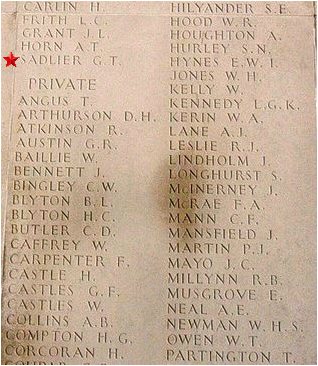 per "Aeneas"
Only son of Margaret Stevenson (formerly Smith), & the late Samuel Smith, J.P.